It’s important for anybody who wants to see how these pieces fit together. VRM’s scope goes into the post-transaction zone as well, but I also don’t want to get too ambitious here. The ovals do a good job, as do the axes. 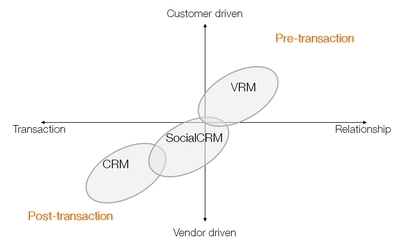 What matters is relationship, and the control both vendors and customers have over the middle ground they share. Toward the bottom Julian lists five companies as examples of “VRM dynamics”. This is cool, but I want to add that VRM at its base level isn’t about the companies doing it, any more than email, messaging or syndicating are about companies. Those things rely on deeper protocols, standards and bodies of code that are pure building material. For a partial list of VRM development efforts, go here.